Once upon a time, a few weeks ago, this Farmgirl and her friend Jen, took a trip. It was a short trip, only 1 hour north. But we had a purpose. The plan was to meet Homemaker Ang at the flea market and kill two birds with one stone. Flea market and a best friend visit. Ang and I talked and she suggested we stop by her farm and pick her up on the way to the flea market. A mini visit with the children and we'll be off! Betty came running towards me. And snuggled up to me. Don't let ANYONE ever tell you that there is no such thing as love at first sight. I can see it*wink* I get attached to animals, so those who are destine to become food I have to separate myself from them. Glad you had a great Road Trip..
We have two young deer that appear quite often down our road. We fear their mother has been killed somehow. We never see her. We keep thinking we may need to feed the two babies, but it's hard to get close to them.They seem to be surviving on their own somehow.Deer are so much fun to watch. They visit our property quite often.We watch them from our porch, where we drink our morning coffee. 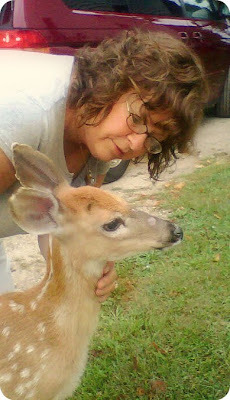 I love the picture of you and the deer - just beautiful! I would love to pet a deer. I hope your flea market excursion was successful!! Flea Market sounds like a fun day. I love the story but I was instantly transported to one of my favorite books at a child...The Yearling by Marjorie Kinnan Rawlings. Two dears in one picture! I love it! How cute!! My kids loved Ang's photos of Betty on her blog!